I picked this up as it was on the short-list for 2017 Carnegie Awards. There’s been a fair amount of criticism over the choices for this year, so I’m curious to read those on the list and see why they’ve been selected (having read a lot of the nominations and been surprised not to see some on the final list). This is a book that I can’t help but feel doesn’t do itself justice. The cover and blurb very strongly hint at its sci-fi/cyberpunk style, and I don’t think it screams ‘read me’ to teen readers. What a shame for those who don’t bother to pick it up! 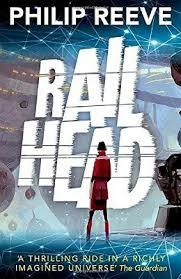 In ‘Railhead’ – the first in a trilogy – Reeve creates a world where humans are no longer bound to Earth, and are able to move from planet to planet by passing through gateways while travelling on sentient trains. Those who travel in this way (railheads) form something of a unique community, and not all seem so keen to allow such travel to take place freely. ‘Railhead’ tells us the story of petty thief Zen Starling. He is one of the aforementioned railheads, and from the start it is strongly suggested that there is more to him than meets the eye. When we are initially introduced to Zen and his family his selfishness was clear to see. This is the boy who himself says he will always choose the winning side, but there is something admirable about him. As we see him get caught up in something we don’t fully understand it takes a while to get answers, but we soon come to realise there’s a whole lot more going on here than we first thought. The style of the book is eminently readable, and the characters – though quite selfish and unlikeable – do act in ways that I couldn’t help but warm to. The depiction of the futuristic world was incredible, and I have to admire the way Reeve actually got me to care about what are, essentially, machines – whether that was the trains (including the Thought Fox, about which I could see myself having nightmares), the creepy Hive Monks or the wonderful Motoriks! I really liked most of the main characters and the sense of threads coming together as I progressed through the story was immensely satisfying. Perhaps I’m reading too much into this, but I felt this really held a mirror up to many of the advances/concerns of our world and will encourage readers to consider their views on a number of topics. Going into this with fairly low expectations, I am pleasantly shocked by how much I enjoyed this story. So much so I’ve ordered book two!